What Happens When City Hall Goes Bankrupt? Why do cities and towns declare bankruptcy? For the same reason that individuals and corporations do: They're broke and can't pay their debts. Life in bankrupt places doesn't come to a standstill — garbage is still collected, fires extinguished — but forget about that new school or bridge. 1975, New York City: The Big Apple teeters on the verge of bankruptcy but is rescued at the last minute, thanks to a loan from the federal government and other measures. 1991, Bridgeport, Conn.: The city, population 140,000, declares bankruptcy after a dispute with the state. 1994, Orange County, Calif.: The county declares bankruptcy after officials make a series of bad investments. It was — and still is — the biggest municipal bankruptcy in U.S. history. 1995, Pittsburgh: The city escapes bankruptcy — barely — by selling its water plant. 1995, Washington, D.C.: The nation's capital is in danger of bankruptcy but is rescued when the White House and Congress establish a financial control board for the city. 2000, Camden, N.J..: The state of New Jersey takes over the faltering city. It's the biggest city takeover in the country since the Great Depression. 2008, Vallejo, Calif.: Faced with a budget crisis, city officials contemplate filing for bankruptcy protection. We know that individuals and corporations can declare bankruptcy, but entire cities? That is exactly what officials in Vallejo, Calif., are contemplating. And they are not alone. There's a long and sad history of municipalities declaring bankruptcy. Here's a look at how these places got into hot water — and what life is like for residents of a bankrupt town. Why do cities and towns declare bankruptcy? The one main difference: Municipalities can't liquidate assets to pay off their creditors — the mayor can't sell the town fire engine to pay the bank. Have municipalities always been able to declare bankruptcy? No. For most of U.S. history, cities and towns were not eligible for bankruptcy protection. But during the Great Depression, more than 2,000 municipalities defaulted on their debt, and they pleaded with President Roosevelt for a federal bailout. "All they got was sympathy," reported Time magazine in 1933. Instead, Roosevelt pushed through changes to the bankruptcy laws that allow towns and cities to file for bankruptcy. They even got their own section of the bankruptcy code: Chapter Nine. How many municipalities have sought bankruptcy protection? Since 1980, 32 cities and towns have declared bankruptcy, according to James Spiotta, a leading municipal bankruptcy lawyer. Most notable of these were Bridgeport, Conn., population 140,000, which declared bankruptcy in 1991. And, in the nation's biggest municipal bankruptcy, Orange County, Calif., sought protection from its creditors in 1994 after city officials made a series of bad investments. What is life like in a "bankrupt" city or town? In one sense, life goes on as usual. Police and fire departments still respond to 911 calls; the garbage is still collected. But don't expect that new bridge or school to be built. For a bankrupt city, all new projects must be approved by a majority of creditors. The biggest hit, though, is to the city's image. Bankruptcy carries a much greater stigma for a city than for a corporation, which is why officials go to great lengths to avoid Chapter Nine. If a city or town declares bankruptcy, does it affect others nearby? Yes. Surrounding cities and towns can find it harder to borrow money for new projects because investors — who buy and sell bonds — will question their financial viability. That's why states often intervene to prop up a faltering municipality and avoid the sting of bankruptcy. Sometimes all it takes for a town or city to get help from the state capital is the mere threat of bankruptcy. "It's an instrument of getting attention and getting others to help you," Spiotta says. What about New York City? Didn't it declare bankruptcy in the 1970s? No, but it came close. The city was teetering on the edge of bankruptcy in 1975 when it appealed to Washington for a bailout. 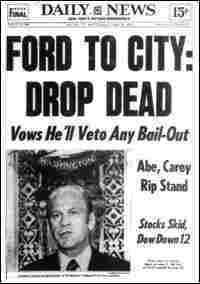 President Ford balked, prompting the famous Daily News headline "Ford to City: Drop Dead." (Ford never actually uttered those exact words.) In the end, Congress did pony up some money for New York, and the city formed the Municipal Assistance Corp. — a quasi-government body that, in effect, allowed New York to lend money to itself. Other big cities — Philadelphia, Pittsburg, Miami — have flirted with bankruptcy in recent decades but not actually declared it. Are we likely to see more towns and cities declare bankruptcy in the future? That's difficult to say, but some experts believe the warning signs are clear: unfunded pension liabilities, an anemic economy, costly infrastructure repairs and falling property values. "All of the ingredients are there," Spiotta says. "I wouldn't be surprised if we start to see more bankruptcies."